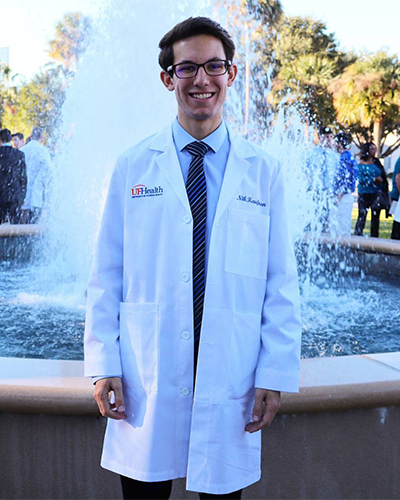 Whether it’s climbing Machu Picchu or pursuing a medical degree, University of Florida (UF) Stamps alumnus and current medical student Nik Kaufman pushes himself to rise to the occasion. Once a doctor, Kaufman wants to give back through practicing medicine, researching, and teaching the next generation of healthcare professionals. With funding from the National Institutes of Health, he is spending this summer studying non-traditional risk factors in the development of cardiovascular disease in women. Kaufman was born in Fort Lauderdale, Florida. His interest in STEM fields began at the Institute for Mathematics and Computer Science. Although, it was when he was diagnosed with Crohn’s disease in middle school that he realized the power of medicine and of having a supportive doctor. At Nova High School, he was involved with debate and took part in extemporaneous speaking. He also tutored through the math and chemistry clubs and competed in piano at the state level. During his sophomore year, he became involved with Chomp the Vote, an organization that encourages young people to register to vote. Within a year, the group registered a record-breaking 1,500 students. Unique advertising campaigns, such as an eccentric Ballot Boy superhero, were a useful tool in raising awareness about the power of political participation. He worked in a gastroenterology lab studying Crohn’s disease, looking at patient data to see if certain factors such as smoking or family history of Crohn’s leads to more disease-related complications. He also volunteered at a physical therapy rehab clinic, where he worked hands on with stroke and cardiac arrest survivors. As part of the UF Stamps Scholars, he has had the opportunity to spend each summer traveling with his peers, starting before his freshman year with a trip to Mexico’s Yucatan Peninsula, where he studied Spanish, tropical ecology, and anthropology. Through this experience, he bonded with peers and advanced his Spanish skills. The next summer, they completed an Outward Bound trip, backpacking in Maine along the Appalachian Trail. This leadership building excursion was the start of his love for nature and spending time outdoors. In summer 2016, he traveled to Cusco, Peru, where he studied Spanish and the Incas. Last summer, he traveled to South Africa for three weeks to study in Cape Town and Pretoria, learning about history and politics. Based on his experiences, he wrote a paper comparing political instability in the U.S. and South Africa. He ended the trip with two weeks in Europe, backpacking with fellow Stamps Scholar Austin Young. In his free time, Kaufman enjoys practicing piano, reading science fiction books, and being outside, hiking, playing Frisbee, and sailing.